when developing Erica Black Series and Pico Series modules, we accumulated quite a know-how on compact and great sounding designs, and we decided to share some of those with DIY community. And therefore Erica Synths proudly presents – DIY Synth Voice module! 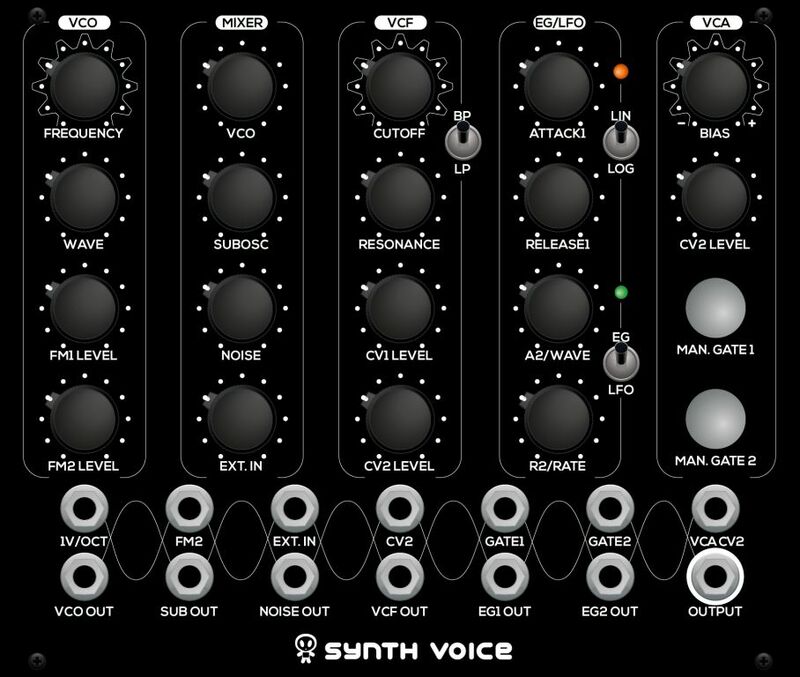 It consists of all essential blocks for versatile monosynth, and is 100% patchable for even more control options. It has digital/analogue design - VCO and envelope generators/LFOs are digital, other parts are analogue. Digital parts are designed arround pre-programmed MCU, which comes with a kit presoldered on a small contoller board. Here's a demo by our teamrider KODEK. There you'll find schematics and extensive build manual. The requested URL /content/upload/DIY/DIY kits/Synth Voice/diy_synth_voice_manual.pdf was not found on this server. That seems a great little system. I can even see it being used as a little standalone synth box. Yep, all good now - thanks. Just ordered one. Very excited to get it. Pretty much going to be the entire contents of one of my lunchbox cases for Knobcon. Should all pots be linear? Is there a substitution for J175? (My usual suppliers don't carry it and it would be the only part). and i'm excited to build my synth voice now (hope the missing parts come soon). This will be the perfect companion for the Mother 32! Currently I am building this having got Kit from Thonk UK. Regarding question Should all pots be Linear?,- I had the same question, but looking at the schematic in the DIY manual R8 for the EXT Audio in, has blue type LOG[100K], and also R10 [100k] for Filter resonance control has again blue typed REV.LOG. All other 100K pots are labelled LIN, whilst all 10K pots do not have either LIN or LOG labelling. As many of the pots are control voltage inputs to the MCU board I am assuming these are 10k linear. However in the BOM there is only one designating 5 off 100K pots.maybe eric synths should update the BOM to indicate 3 off linear and 2 l off LOG 100K . Overall I really like the architecture of this Erica Synth Voice and its Digital analogue split splitting up the VCO multi waves and envelopes as Digital and providing the Polivoks Filter, as analogue. hanks Erica Synths! On my build the digital part does not seem to work. Noise, Mixer, VCF, VCA are working well, but not VCO, EGs /LFO. (They still work with processor board taken out, so i assume the error is to find there). No signals at VCO, SUB, EG1, EG2 outs, LEDs do not flash even with manual gates. 0V, 3.31V, 11.72V and at big top 3.31V as well, so it should be powered correctly. There is still no change after reflowing all solder joints to processor board connectors. putting together a parts list for this. R36 and R40 list "OPTION", and one of them gets populated half way through the build guide. No value is given. What option are they for? Similar question to those already asked bout the pots. So when i turn the knob to the left, the sound ic completely filtered out before it's all the way to the left. And then in the last part of the knob turn, the sound softly rises again.. any ideas on how to fix this? My guess would be to put some kind of resistor in one of the two optional places next to the cutoff pot... but no idea which value and if my assumption is correct. I recorded the sound to clarify. putting together a parts list for this. R36 and R40 list "OPTION", and one of them gets populated half way through the build guide. No value is given. I want to know this also. In the build instruction picture R40 is populated. If you look at the schematic you can see they're used to adjust input gain. Leave them blank for default configuration. Finally BOMming this. Did we ever get a definitive answer for the pots? The current version at Erica still shows 13x 10K and 5x 100K, with no taper specified. I can see a few explicitly given in the schematic: VCF cutoff = 100K lin, resonance = 100K rev. log, VCF CV2 = 100 lin, EXT = 100K log. But everything else is non-specific. Girts? would also be interested to know this! I mailed Erica Synths a while ago ... and their "marketing specialist" ( ) wrote "In our Synth Voice kit all pots are linear". I ordered a set of linear pots but have been reluctant yet to solder them in. I finally got around to building this at the weekend. I used the pots I listed in my last post, although I subbed a linear for the reverse log one (resonance). I can't tell that it has any adverse effect. All in all, this is one cool module. It's not particularly complex to build and gives you something that's pretty flexible and sounds good too. This module is my first DIY build I'm doing without a full kit where I have to source the parts. I made a google spreadsheet with a list of the parts I source from their respective vendors (Tayda, Newark, and Thonk) with prices. I was wondering if someone who has built this module would be willing to take a quick look to make sure there are no glaring errors. 2. There is an option to use 100uH ferrite beads or 10ohm resistor. What is the difference? Also what does 100uH refer to in reference to the ferrite beads, Google wasnt turning up much for me. 3. One of the resistors says 49.9k with 1% tolerance which I couldn't find at the vendors I was using. Would a 50k resistor with 0.1% tolerance be an acceptable replacement? Thanks. Also let me know if posting vendor links in a spreadsheet and prices is either disallowed or bad form. I didn't see any rules about it but I'm new here. I've got some answers and some questions! - There's a thread on here about ferrite beads but apparently it will have little effect in this kit (says so in the build doc) so I reckon its safe to go for the 10 ohm resistors. The ferrite beads help reduce noise in the circuit. - I'm pretty sure that the tolerances aren't soo tight that replacing a 49.9K (1%) with a 50K (0.1%) will make a difference: especially as this gives a resistance crossover region between the two options of up to 449 ohms. Personally, I'm struggling to source the 10uF Non-Polarized Electrolytic Capacitor, the MCP6002 and the J175. Where are the best places to find these?? Also what is the consensus on the 100K pot situation - the schematics suggest a mixture of log and lin yet apparently the response from Erica Synths is that they are all Linear?? And if you can't get the 6002 i have a shed load and could easily send you one. Not sure about the caps, Farnell only seem to have US stock, and I haven't had time to check elsewhere.